After a fairly short ride from Ilha Grande we arrived at the last destination of the trip and checked into the hotel. The drive through the city was pretty cool as there are views of Sugarloaf and Corcovado. 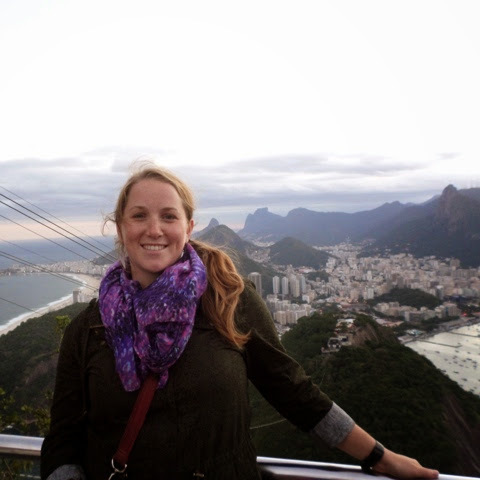 The first sighting of Christ the Redeemer was very exciting! I can’t believe we’re here, all these places and views are so famous that it almost doesn’t seem real. 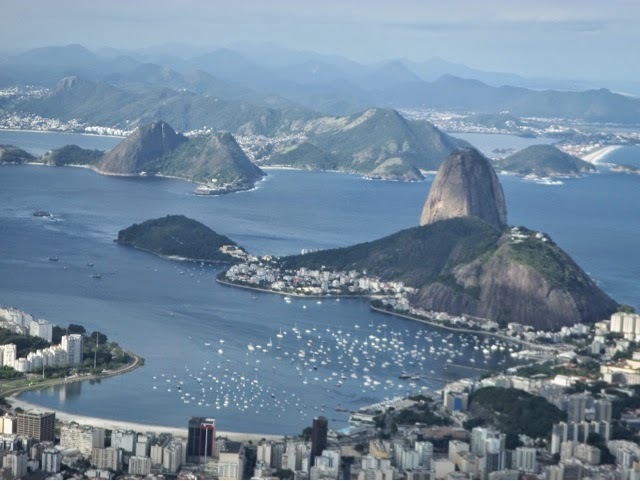 Rio de Janeiro was discovered in 1502 by a Portuguese sailor. He actually thought that the bay was the entrance a huge river and called the area Rio de Janeiro which translates as ‘January River’. The area wasn’t settled until later, 1555, by the French, but the Portuguese took control of the area in 1567. Settlers profile rated despite the local tribe, the Tamoios people, attacking the settlement on a regular basis. Unfortunately the indigenous group were completely killed off and no descendants remain. The city grew to become the leading city in Brazil as it was the port from where gold exports left the country and was the centre point of the agricultural trade. To support industry the Portuguese imported huge numbers of African slaves and by the eighteenth century the majority of the population was of black African origin. However Brazil was different to many other colonies in that it actively encouraged miscegenation. Therefore the majority of the population is still black and African customs are prolific. You can really see the difference in the demographic here compared to the other countries that we have visited in South America. It is also interesting that during the 1800s the King of Portugal actually opted to stay in Brazil rather than return home after the conquer on Napoleons Bonaparte’s defeat in Europe. After independence from Portugal was granted, in 1834, Rio was declared capital of the empire. The modern city is split into two zones, the northern and southern zones, Zona Nort and Zona Sul. The area in between is called O Centro, which is the business centre of the city. 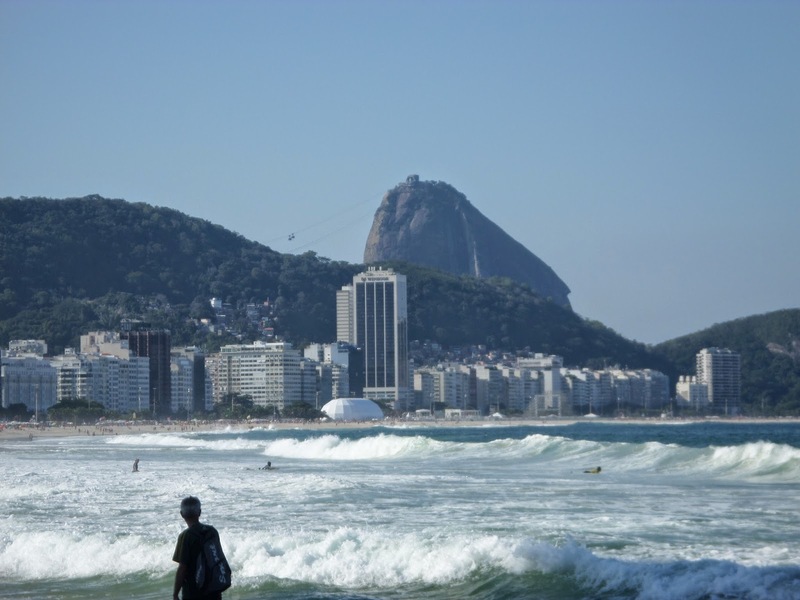 Tourists mainly stick to the Zona Sul where the beaches are located including the famous beaches of Copacabana and Ipanema. 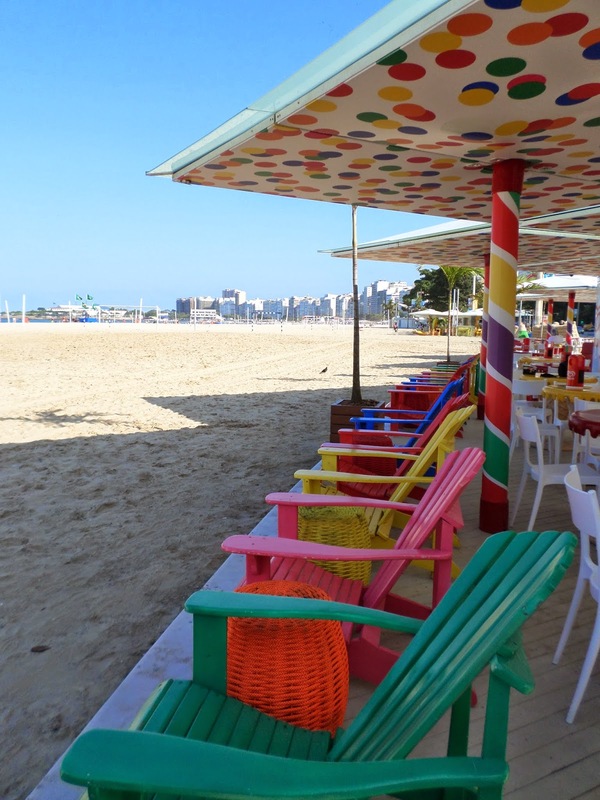 The hotel is only a block back from Copacabana and the breakfast room has views out across the beach, and all the way over to Sugarloaf which are amazing, quite a fitting end. My first stop was a city tour, our guide was the hugely smiley Lucas. The tour headed up Corcovado, which is the name of the mountain that overlooks the city. The name Corcovado translates to mean ‘hunchback’ in English and it is essentially a big granite dome. Along the way we drove past the lovely Lago Rodrigo de Freitas. The lake is really nice and is surrounded by parkland and residential areas. It seems like quite a nice peaceful and wealthy area and I saw lots of locals working out on the outdoor gym equipment and jogging. The lake is named after a man who used to own and invest heavily in the areas around the lake during the development of the city. Due to the large number of tourists heading up the mountain everyday transport on Corcovado is tightly controlled. 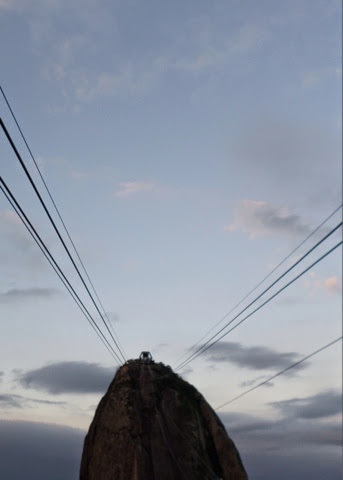 You have to leave your own transport and get into either an electric train or mini bus operated by the Tijuca national park, which the mountain is located within. The Tijuca national park is the largest urban forest and makes up over 7% of the city and is a bit of a mini paradise within the city. It also separates the Zona Nort and Zona Sul and is home to lots of animals including monkeys! From the bus you can either walk up a short set of steps or get a glass elevator and escalators up to the statue. 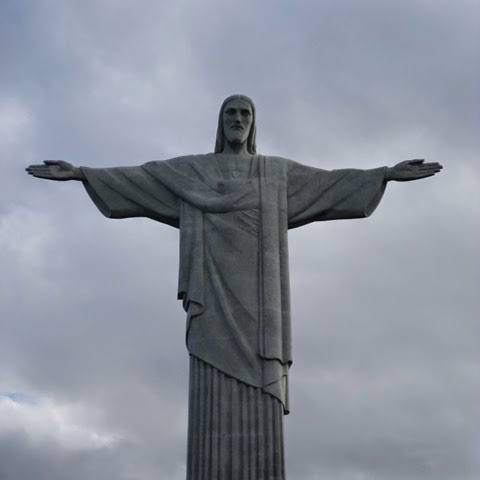 The name is Cristo Redemer in Spanish and it’s over 30m tall, weighing over 1000 tonnes! 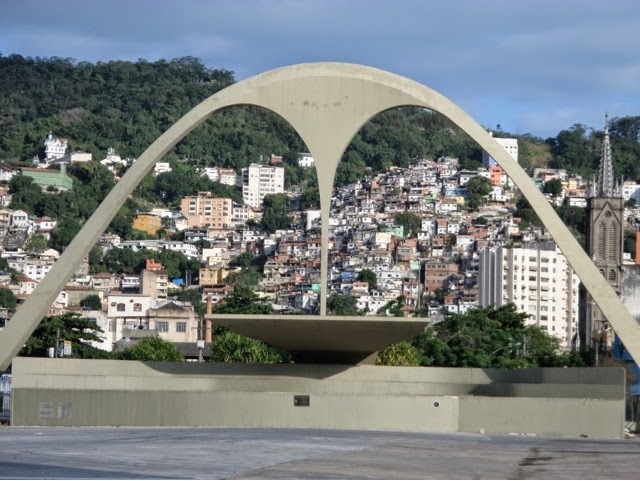 It was designed by a French architect and sculpted and was transported in Brazil in pieces and then assembled here. The hand of the sculpture was damaged by a lightning strike last year so it had to be repaired, but as it’s constructed from concrete and soapstone this is relatively easy to do. The first views you have of the statue as you head up the steps are of the back of the statue. It’s so large and imposing, it’s extremely impressive. There are then two viewing platforms around the front of the statue that have stunning views over the city. You can see across the North and South, the lagoon and the beaches. It’s very difficult to get a good photo though as there are so many people up there. It was also very overcast, but luckily it wasn’t raining! We were very lucky that day as the statue had been enveloped in cloud for the last few days. View over to the beaches and Sugarloaf, the beach below is Praia do Flamengo, with Copacabana over to the right round the headland from Sugarloaf. On the way down back into the city we passed through the wealthy neighbourhood of Santa Teresa, where there are lots of lovely houses with great views looking out across the city. The suburb was established by a convent and is famous for being the last area for having a tram service. The tram service was made to run along a tramway made from an old colonial viaduct structure. It used to cost two cents for a seat or be free for standing passengers, so it was always very full. Several years ago the tram collapsed and turned over due to the number of passengers hanging onto it resulting in the death of 5 people. The tram was meant to be restored and back in use in time for the World Cup, but this has not happened. Locally there are images of a crying tram, which the locals display to show their sadness that the tram service is not available. 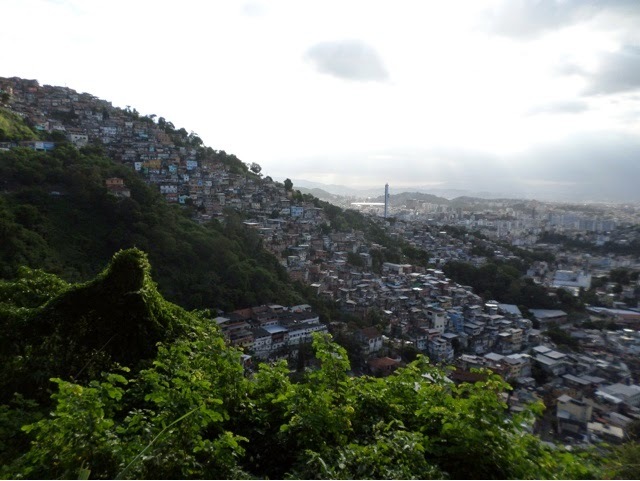 View of the favela and out across the city from Santa Teresa. 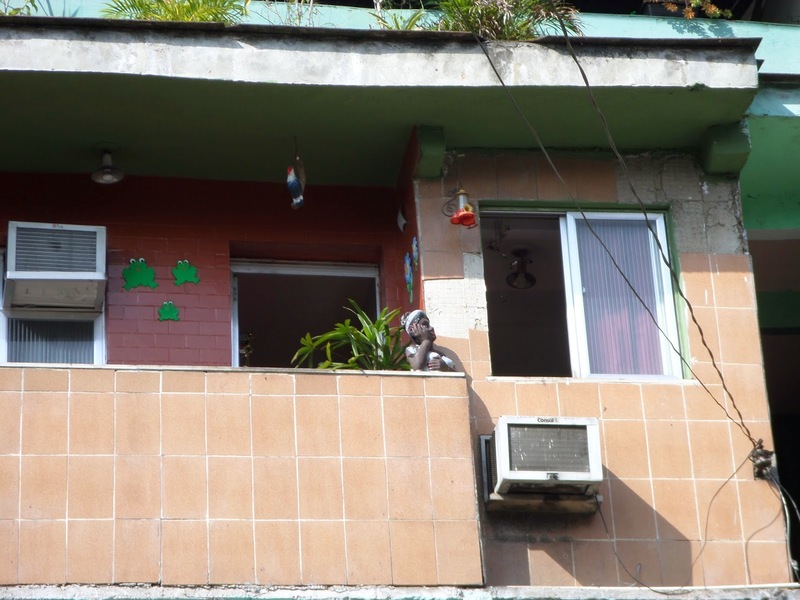 There is also a small favela located in Santa Teresa which runs up a steep valley. 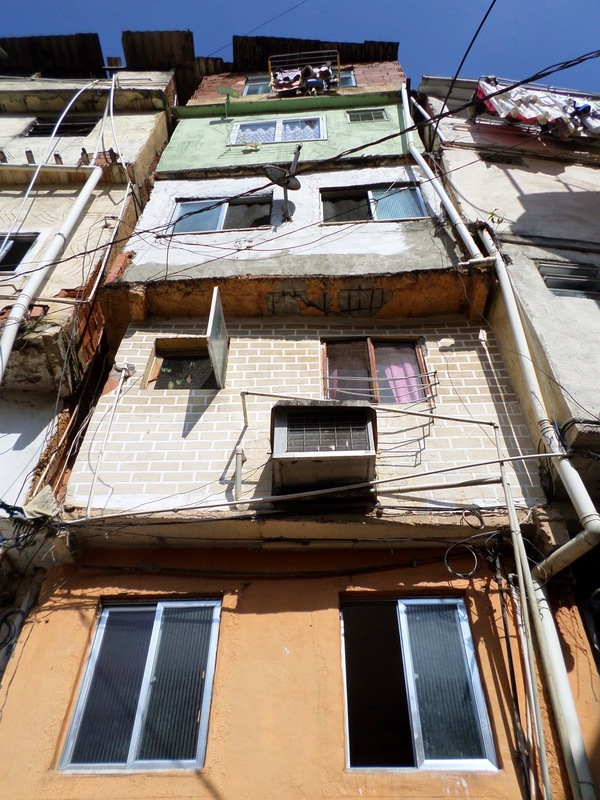 In Rio over 20% of the population live in favelas and so you can have extremely rich and poor people living opposite one another. As I’m doing a favela tour tomorrow I will find out more about them then. 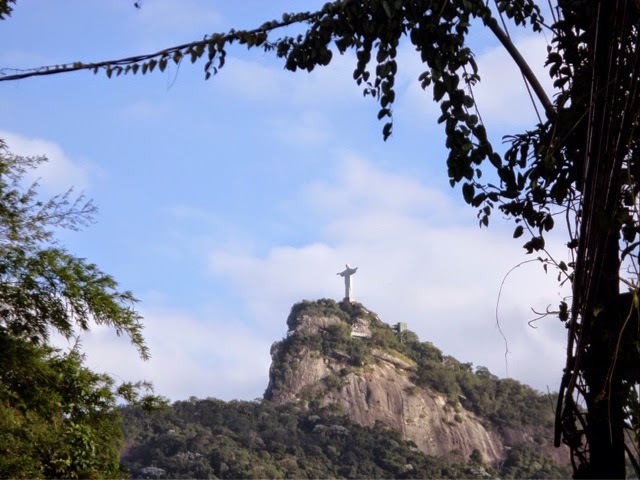 View up to Corcovado and Cristo Redeemer from Santa Teresa. We then stopped briefly to check out the official carnival arena, where the actual competition is held every year. It consists of a long concrete road with high level seating stands on either side which finishes at a small stage area. There’s a large concrete sculpture at the end which the tour guide reckons is meant to represent a woman’s buttocks wearing bikini bottoms! I’m not so sure that is the official explanation but you can definitely see where he’s coming from! Not sure this is what my bum looks like in a bikini! 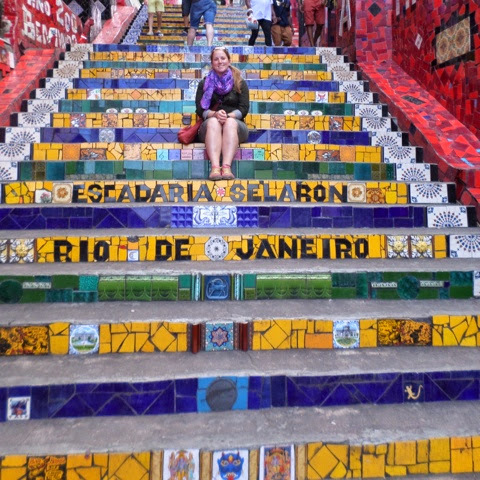 From there I checked out the Escadaria Selaron, or the Selarón Steps, which I really thought were just beautiful and an amazing testament to one man’s love of his neighbourhood. The steps are named after the artist Jorge Selarón. He was a Chilean man who immigrated to Rio and fell in love with the city and also Brazil, not difficult to understand! Back in 1990 he began to decorate the steps outside his house as they were quite run down. 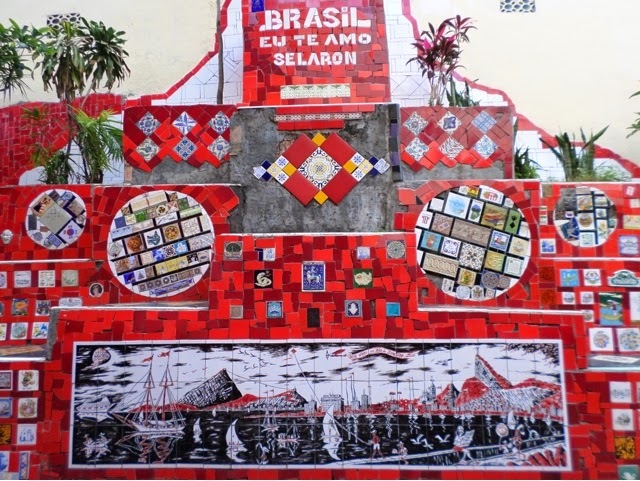 He used brightly coloured tiles in the colours of the Brazilian flag, so yellow, green and blue. But the tiles are a big hodge podge of tiles from all over the road that fans sent to him. Over time he covered the entire stairway in tiles, it’s actually very impressive and visually striking. It’s also now a major tourist attraction. Large picture tiles at the start of the stairway. I loved how bright and colourful everything is, all the tiles are different so there’s so much to see and lots of very quirky little details everywhere. 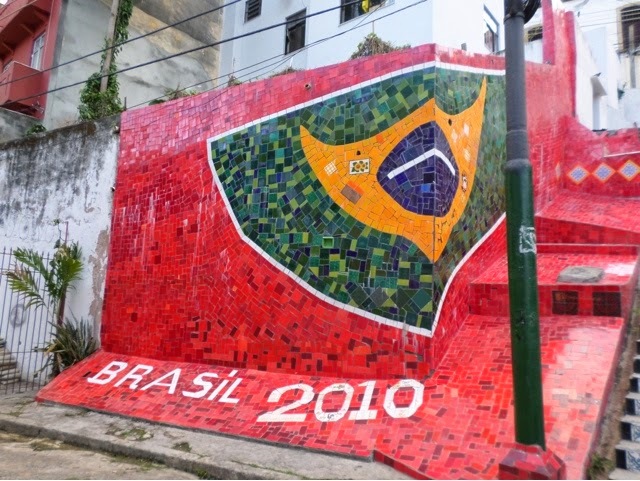 At the top of the stairway is a large tile mosaic of the Brazil flag. Sadly Selarón was found dead on the steps in January of 2013, certainly a huge loss for his community. It’s unfortunately thought that he met with foul play as his body was covered with burn marks, although no one knows officially what happened to him. As the afternoon was drawing to a close it was time to head on over to Sugarloaf to catch the sunset, or what we could see of it through all the cloud! Sugar loaf sticks out into the Atlantic Ocean and is almost 400m high. It was named after slave settlers thought it looked a bit like refined loaf sugar. To get to the top you take a series of cable cars. You have great views across the city again, although this time you can actually see the full 360 views, if you walk around the different viewing platforms. You can also see over to Corcovado and Christ the Redeemer. 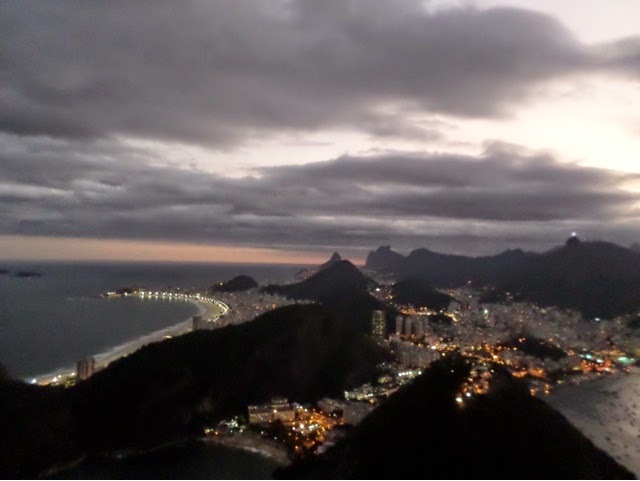 You can just see Corcovado off to the right, with Praia do Flamengo and then Copacabana to the left. It’s a great spot to watch the sun go down and the city come to life. You can just see how the statue has been lit up on Corcovado in the photo. I wish my camera had a better zoom and night setting! 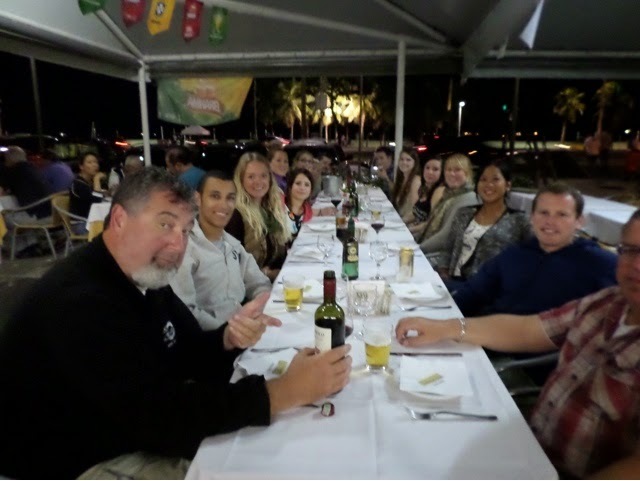 That night was the last official night of my tour and we went for a big group meal down by the beach, which was lovely. It will be sad to say goodbye to everyone as it’s been a good bunch :-). 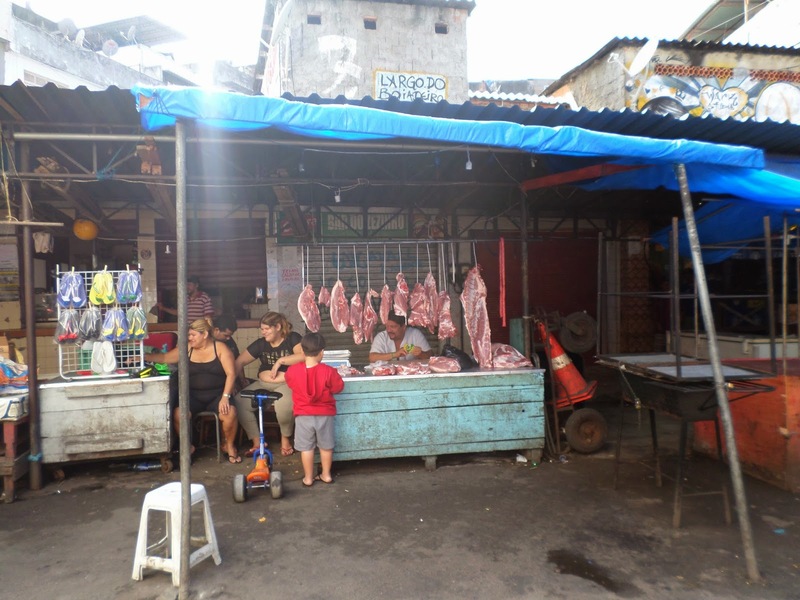 The following day I did a tour of some the favelas, with a company (Favela Tour) that is operated by staff from the areas they take you to see, so it is actually supporting the local economies. The feelings I have about favela tourism are rather mixed. Whilst it’s good to highlight the needs of the people living in these communities, as they face huge discrimination and poor conditions, it also seems rather gawpish. If someone decided to tour the council estates of the UK you’d think they were mad… However, people are also benefiting in the forms of stable jobs and income from tourists presence. So all in all I’m just not sure what to think really! 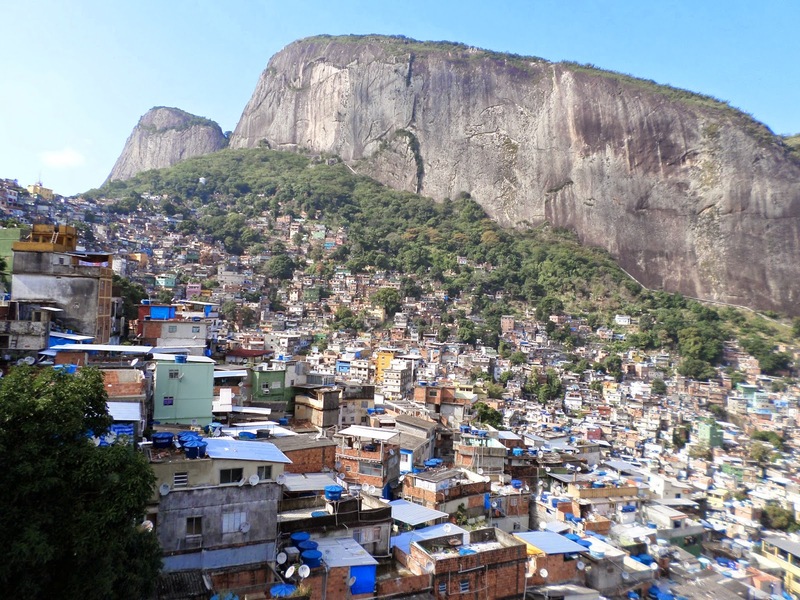 Favelas grew as a form of necessity and as a fall out of abolition. As the black slave population did not have homes to go to when they were released from service they built their own. 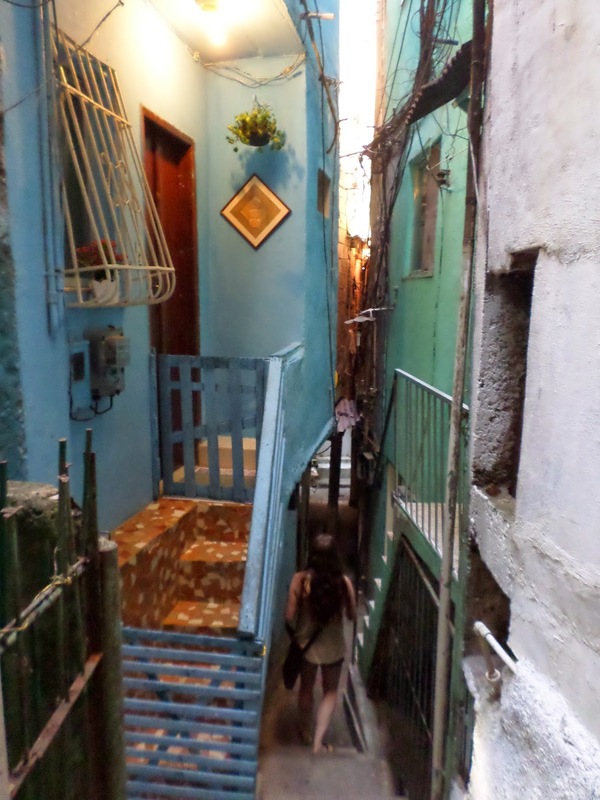 The favelas generally run up narrow steep ravines i.e. the parts of the city that weren’t developed for proper housing estates. Many of the original residents were skilled in the construction trade, as they were working in building the city and as such they used left over waste materials to build their own homes. As a result the earlier homes were generally constructed to a reasonable standard. As time has passed people have continued to build more and more stories to their houses and they are becoming increasingly at risk. Many of the areas are at risk of landslides, further risk to the houses. There are over a thousand favelas of varying size in Brazil, of which only a few hundred have been pacified, making them safe to visit. 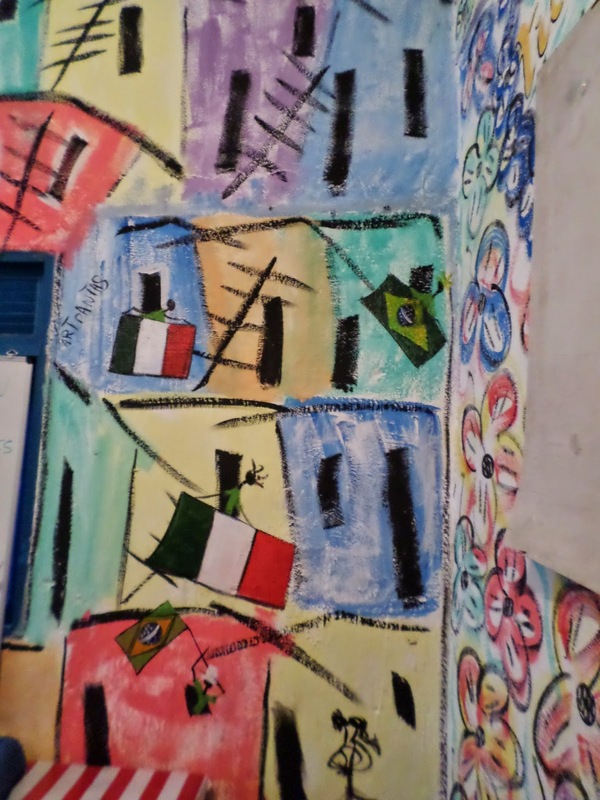 The first favela we visited is the largest one in Brazil, called Rocinha, which has around 70,000 residents. Its name actually translates to mean “little farm”. 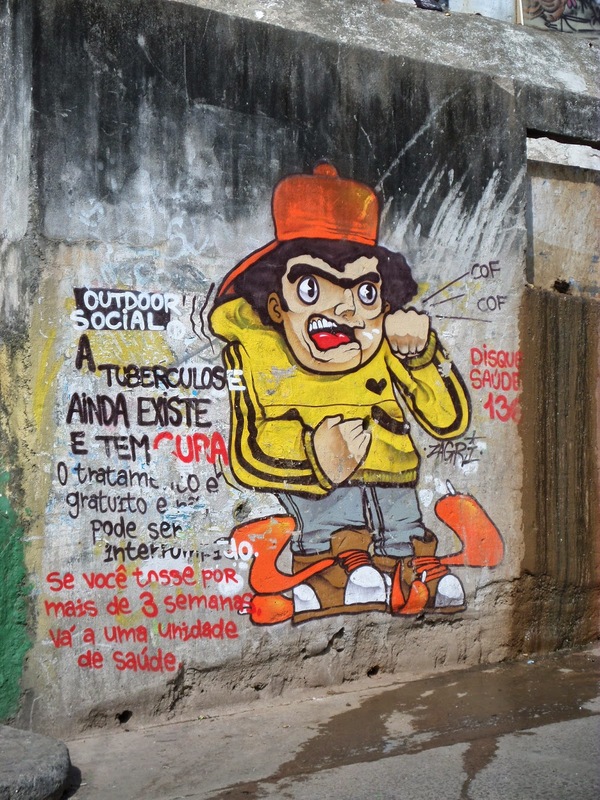 TB is still a big issue for people living in the favelas, who are less likely to have the money to see doctors. There is a lot of street art and posters around informing people that it is actually a treatable disease and what to watch out for. From a balcony in the back of someone’s garage there are great views out across the favela and down to the beaches. The houses are so colourful and most of them even seem to have satellite dishes! Many of the streets have been decorated with streamers for the upcoming world cup, although to be honest the people of these communities will have lost out rather than gained much from the event. 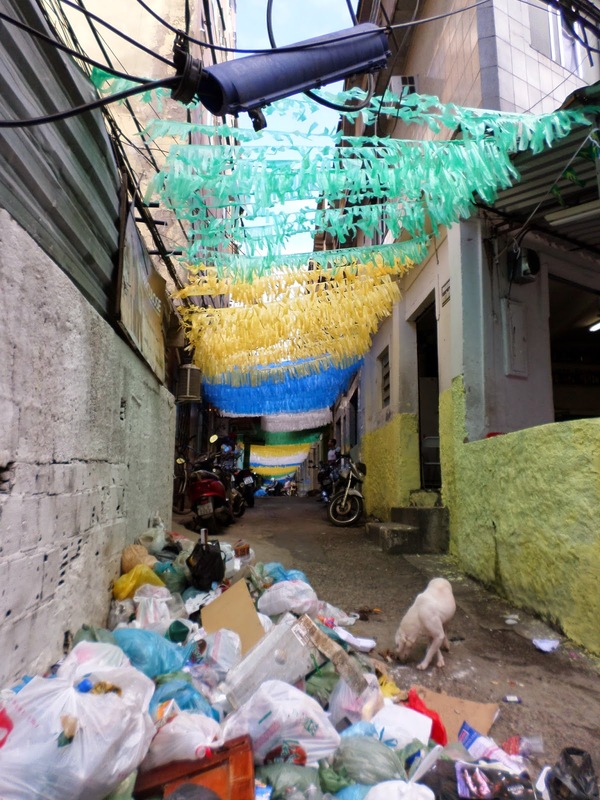 Efforts to increase the quality of life for people in the favelas includes waste removal services which now come twice a day to remove waste bags from designated spots. Down at the bottom of the hill are the market stalls and shops. There were large shops just filled with cages of live animals: mainly chickens, but also a few pigs. At least you know it’s fresh… if you get there early – the meat just hangs out there all day otherwise. 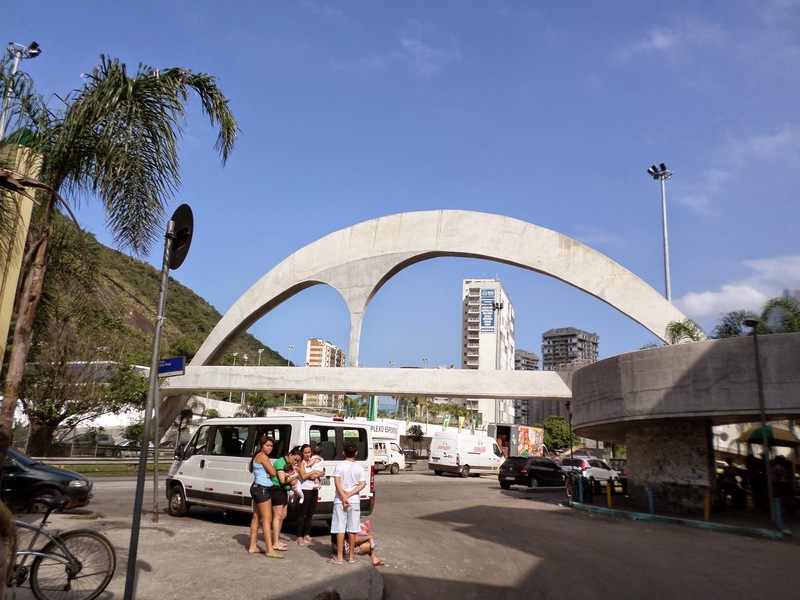 At the end of the favela is a large bridge which allows residents to safely cross the large and busy road. 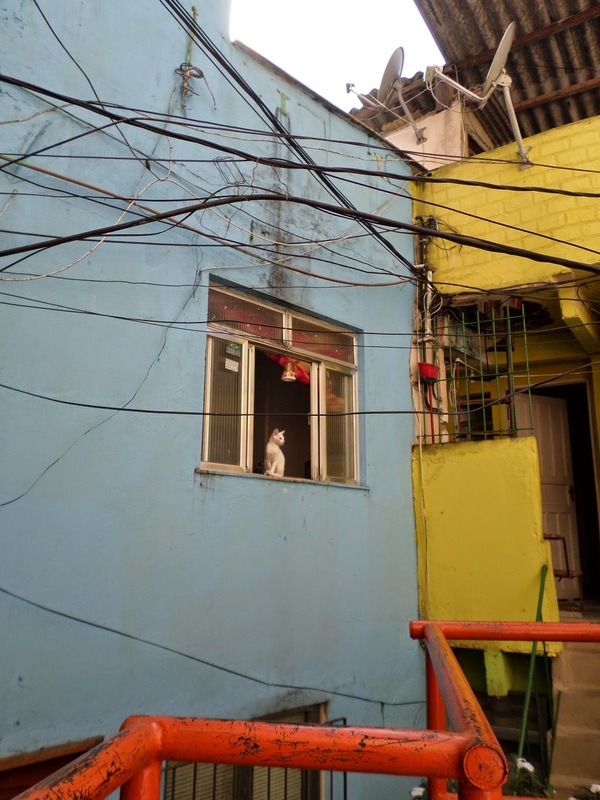 It also connects the samba school to the rest of the favela. It looks very similar to the one at the Samba arena. Next we headed over to Vila Canoas, which is the favela that our driver lives it. It definitely feels a bit strange as there are extremely fancy looking houses along the one side of the road and then the favela! We visited the “Para Ti” school, which was set up by the ex CEO of Fiat, his family still run their charity which funds the project today. The school stays open every day and provides children with much needed education and stimulation. This helps to keep them off the streets and getting into trouble or involved with crime. They even have computer facilities now. It seemed like a nice place and all the kids’ very smiley and happy. The walls are all painted great bright colours. From the school we took a walk down through the street of the favela – I say streets but really mean teeny tiny alleyways! In most places they are only wide enough for you to walk through and in places I had to duck! The houses here are stacked 3-6 storeys high and you can see how they’ve just been tacked on above one another. There was this cute little cat sat up high on a window ledge watching a small hummingbird buzz around it. I kept waiting for it to jump out, but it never did! At one point we walked under a building and next to what seemed to be a river! There was also a doorway that even I would have struggled to duck down under. 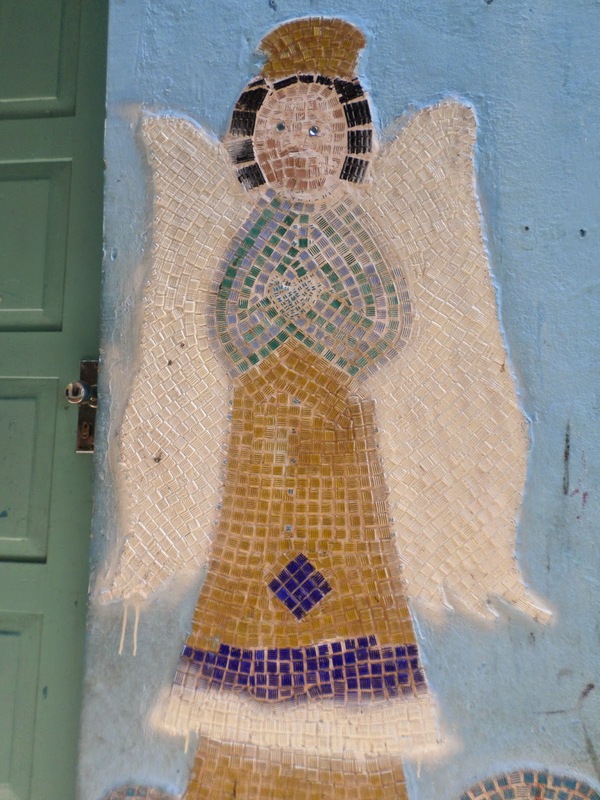 There is a chapel in the middle of the favela and there is a lovely mosaic angel outside. 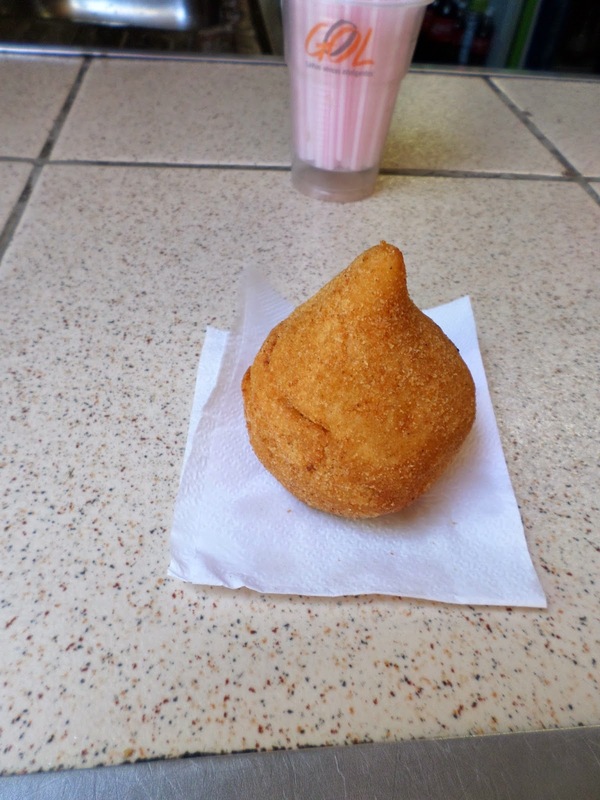 Before hopping back into our tour bus we stopped at a local cafe for drinks and snacks, including these great potato balls which are filled with cheese and a spiced shredded chicken – they were awesome! The afternoon was low key, as it was my last afternoon in town and our last afternoon as the girls all together! 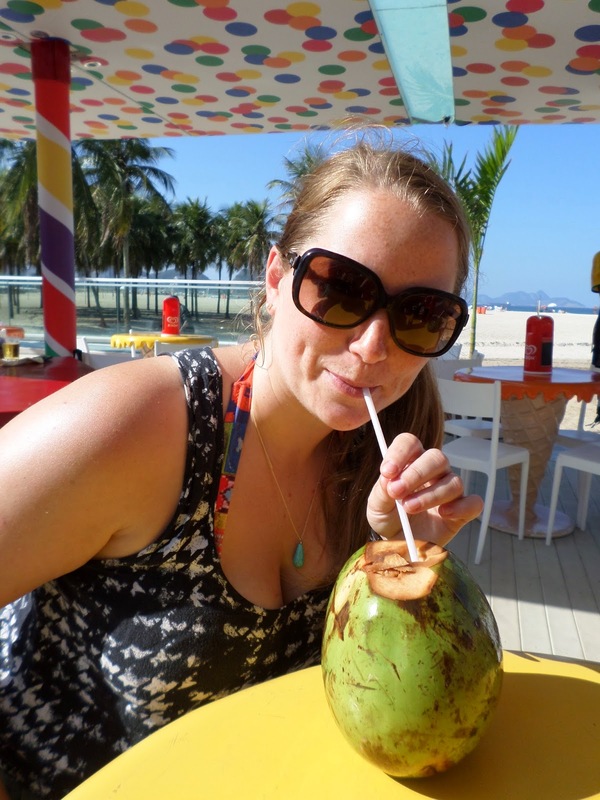 We walked down to the beach and had lunch on Copacabana beach with fresh coconuts Om Nom Nom. The beach was pretty empty as although it was nice and sunny it wasn’t very warm – only 23 degrees. Although I guess it is almost winter so that’s not too bad. I really like the bars and cafes along the beach walk. There’s a great running track which is separated from the traffic too, which is great. 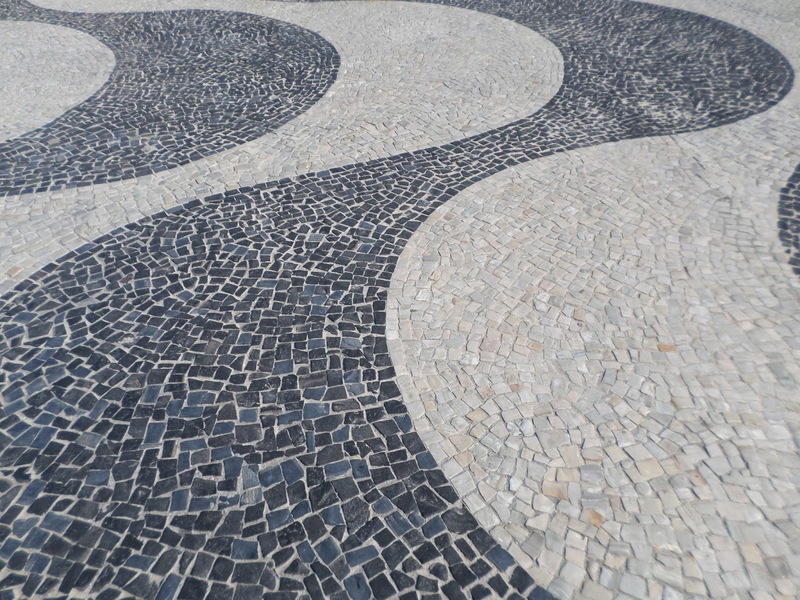 The pavements are all paved in black and white tiled patterns, which look really nice and the variety of patterns gives the different areas character. The beach is really quite long and you have views over to Sugarloaf, you can see the cable cars going up and down the mountain. 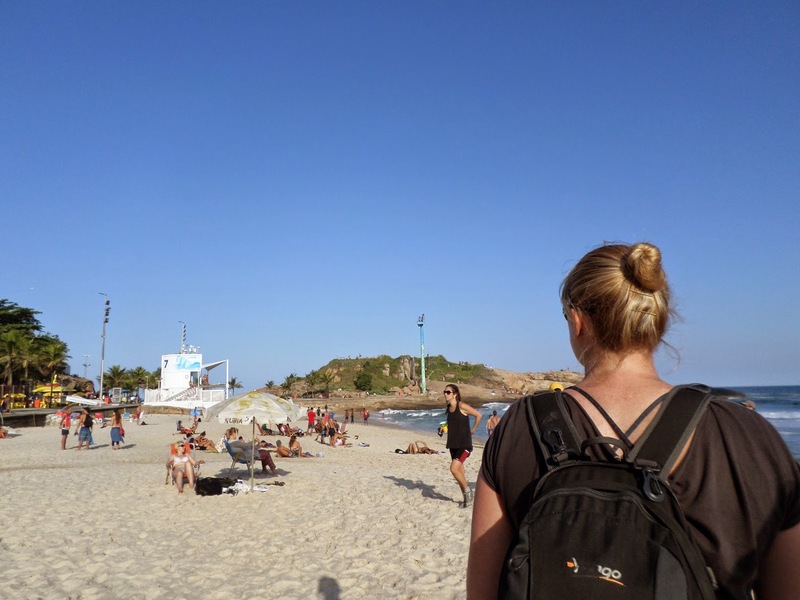 We walked the length of the beach and then around the headland via the shops to Ipanema, where all the beautiful people are. It was far sunnier around on Ipanema so we even managed to get the bikinis out! Although not for long before we retreated due to the cold! 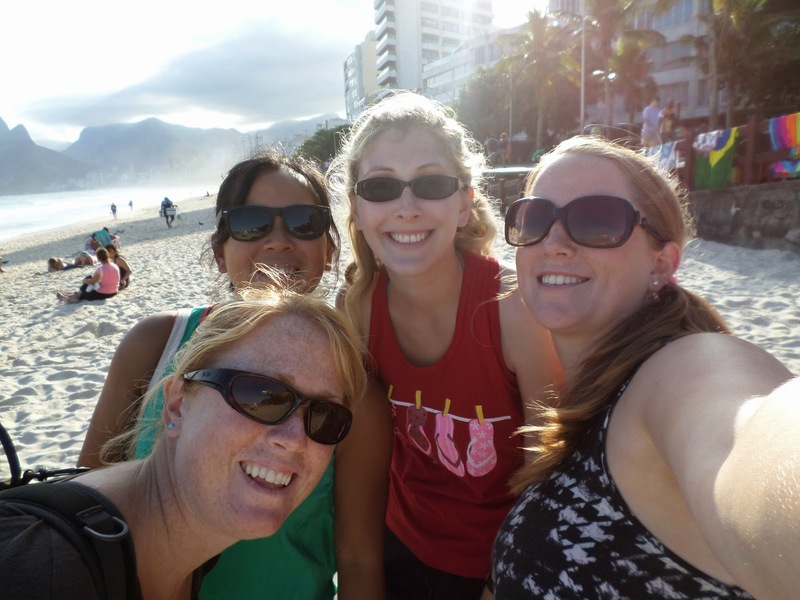 We had to fit in a final beach selfie! It was fun to just sit and people watch for a while before heading back to the hotel to pack :-(. I had my last dinner with the girls at a small Italian restaurant and then headed to the beach for cocktails – had to get a last few Caipirinhas in! I then said my goodbyes – it was very weird being the first one of us to go, but I would rather that than be the last! I jumped in a cab and headed to the airport to commence my mammoth journey home! I flew back with Emirates via Dubai and Perth and it took me 39 hours- killer! The first flight was pretty good actually as the flight was half empty. It was slightly odd though as there were only 6 female passengers on the entire plane! I scored a row of four and was able to lie down to sleep for a bit. In Dubai I wandered around the duty free and picked up the obligatory bottle of perfume but stayed away from the designer handbag stores :-). By the time I reached Perth I was pretty spacey and everything was closed as it was late – although I did get complimented on how “fresh” I was! I just sat and drank wine and watched the football on TV for five hours before getting on the final flight! That was the worst flight as my seat didn’t work properly and wouldn’t go back – but it wasn’t too long thank goodness! So I’m now home and contemplating a return to normal life. I have had a wonderful on this journey of a life time and hope that you have enjoyed joining me! I have greatly enjoyed writing this blog and hope to continue as my next adventure begins, so keep your eyes peeled. I have been truly blessed to have this opportunity and will always treasure the memories made. I have met some absolutely brilliant people, after all it’s the people who make the experience. To have met a group of girls who could all get on so well for an extended period of time living on top of one another was extremely lucky and I will miss them every day. I have met people that inspired me and others who tested me in both the best and worst ways. This trip and the people I have met along the way have really helped to clarify the last unresolved decisions I had left to make about where my life is now set to go. The next year is now set to be an extremely exciting time! So in 87 days I visited 7 countries, speaking two European and countless indigenous languages. I have covered 10688km, including 13 border crossings, by bus, van, car, taxi, ferry, speedboat, hiking and canoe. I have seen cities, forests, mountain-peaks and volcanoes. I have hiked up a river in the amazon and up an active snow-capped volcano with crampons and ice axes, ridden horses, herded cattle, cycled the death road, swum in a natural mud pools and jumped off boats into clear blue waters, cooked empanadas and drunk far too much great wine and national cocktails. Now the only question that remains is where to next….? This entry was posted in Travel and tagged Beach, Carnival, Christ the Redeemer, Coconut, Copacabana, Corcavado, Favella, Intrepid, Ipenema, Lago Rodrigo de Freitas, O Centro, Para Ti, Praia do Flamengo, Rio, Rio de Janeiro, Rocinha, Samba, Santa Teresa, Selarón, South America, SouthAmericanAdventure, Steps, Sugarloaf, Travel, Vila Cancas, Zona Sul. Bookmark the permalink.